Wendy B. Libby, Ph.D., president of Stetson University, announces the launch of the Beyond Success — Significance campaign at a gathering in Lake Mary, Fla. See a student’s perspective of the event. $80 million earmarked for student, faculty support. Stetson University has launched a $150 million comprehensive campaign, its first fundraising campaign since 2009. 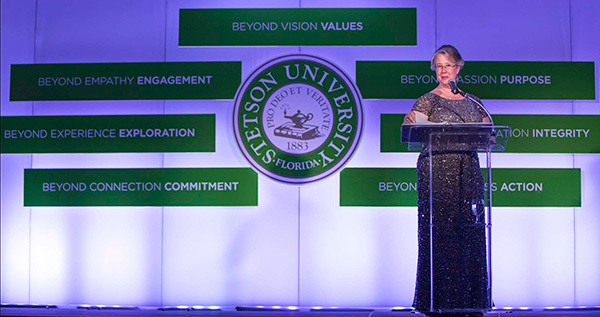 The Beyond Success — Significance campaign comes at a time when Stetson is celebrating unprecedented growth: it recently welcomed its largest incoming class in its 132-year history, and its DeLand, Fla., campus is in the midst of significant construction and renovation projects. Funds raised will be used for facilities, $50 million; student support, $40 million; faculty support, $40 million; and current use resources, $20 million. To date, more than $80 million has been raised. Why is this campaign so important to Stetson’s future right now? Over the past six years, prior to the campaign’s launch, Stetson has developed new interdisciplinary academic programs and hired more than 75 new faculty; weathered the declining interest in law school attendance to emerge with a more robust College of Law; dramatically increased undergraduate enrollment by 40 percent; improved the quality and diversity of first-year and transfer students; made an enormous dent in deferred maintenance on all campuses; added athletic teams; and is approaching critical milestones in salary equity and compensation for faculty and staff.